“Sailing Yacht A”, Privinvest’s new giant, ready for sea - Africa M.E. Privinvest just announced the delivery of “Sailing Yacht A”, “the most advanced sail-assisted superyacht ever built”, says the company. Measuring close to 143 meters (468ft) with a gross tonnage of nearly 12,600 GT, making the ship one of the greatest Passenger Yacht Code (PYC) superyachts in the world in terms of design and technology. “Sailing Yacht A” is a technical prowess boasting unique features such as an underwater observation pod, a hybrid diesel-electric propulsion system and state-of- the-art navigation systems. The three masts are the tallest and most highly loaded freestanding composite structures in the world. The mainmast towers 100 meters above the waterline. 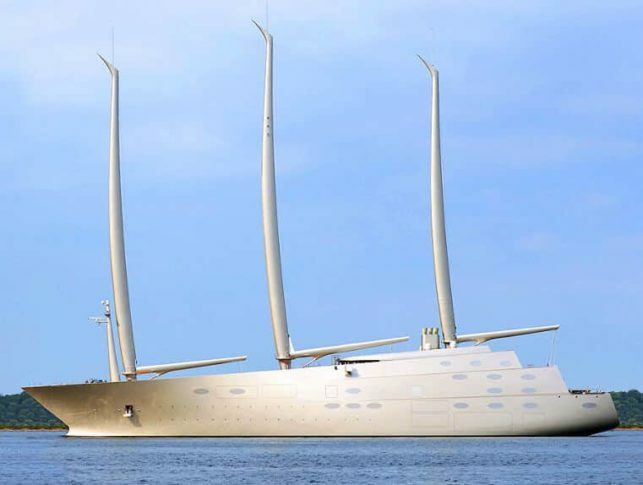 Philippe Starck created the design, which aims to challenge the expectations of conventional aesthetics as he did for Motor Yacht A.
Iskandar Safa, Founder of the Privinvest Group, comments: “Sailing Yacht A” is a true revolution in the naval industry, she is the first of a new generation of ships embodying modernity, breaking both engineering and design boundaries”. Steel hull and steel superstructure with high-tech composite fashion plates that can be formed into any shape or size are key features of “Sailing Yacht A”. Nobiskrug, a luxury yacht builder, has worked on the development of these technologies over the past 15 years, and was able to combine technological expertise with large facilities. Privinvest, headquartered in the Middle East and founded by Iskandar Safa, has facilities and shipyards in a number of countries including France, Germany and the Middle East. Privinvest’s shipyards have delivered more than 2,000 vessels and its products are present in more than 40 navies around the world.